Click on the black and white image to download a pdf that can be printed on A4 card. Instructions on how to make the mask are included on the sheet. – a piece of string or elastic to attach the mask to your face. – a sharp pencil and blob of play dough for making holes in the card. 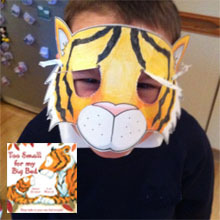 Here’s a rhyme about Piper the little tiger cub. Can you make up actions to go with it? 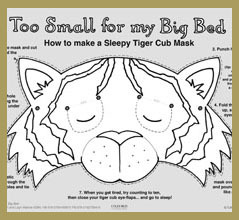 Open the flaps on your mask when you’re a wide awake cub, and close them again to go to sleep! Tiger cub, tiger cub, turn around. Tiger cub, tiger cub, touch the ground. Tiger cub, tiger cub, pounce and leap. Tiger cub, tiger cub, go to sleep. Wake up! Oh no – it’s still night time! Tiger cub, tiger cub, never fear. Tiger cub, tiger cub, Mummy’s near. Tiger cub, tiger cub, count to ten. Tiger cub, tiger cub…sleep again.